Kingston Digital has claimed the title of World's Highest Capacity USB flash drive - up to two terabytes! 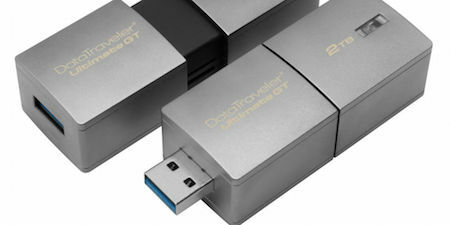 Admittedly, it's a bit chunky - the Kingston DataTraveler Ultimate Generation Terabyte device is larger than some flash drives. How much can you pack onto a 2 TB drive? About 34,000 hours of MP3s, 80 days worth of video, 620,000 photos, 1,000 of high-definition movies. In a press release, Kingston claims it can carry 70 hours of 4K video. As SanDisk parent company Western Digital noted when it released its 1 TB flash drive last year, a flash drive that can contain this much memory could easily find a home in fields as varied as virtual reality to global surveillance. Amazing real-world devices like these make me think back to the Schrön Loop from Dan Simmons excellent, award-winning 1989 novel Hyperion.